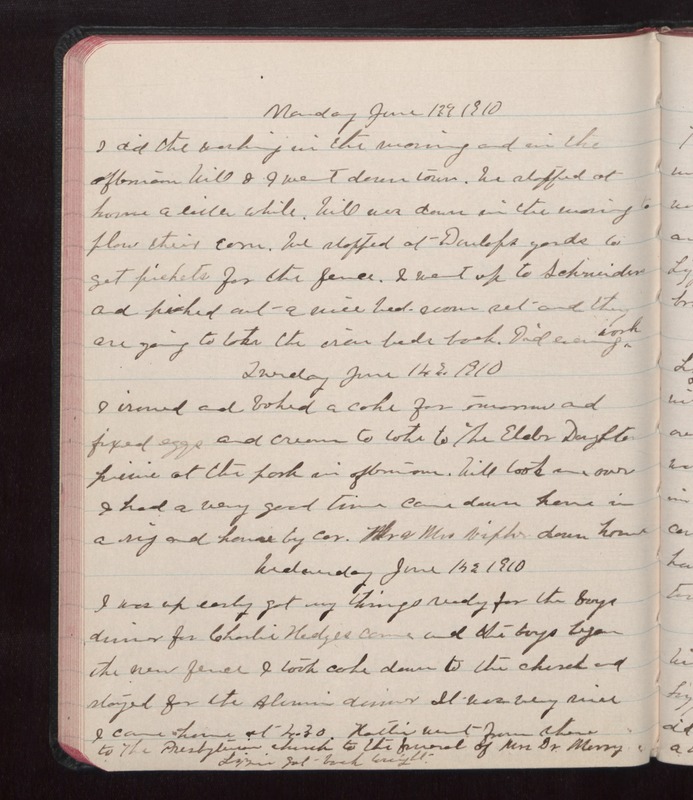 Monday June 13 1910 I did the working in the morning and in the afternoon Will & I went down town. We stopped at home a little whilte. Will was down in the morning to plow their corn. We stopped at Dunlops yards in get pickets for the fence. I went up to Schwinders and picked out a nice bed-room set and they are going to take the new beds back. Did evening work Tuesday June 14 1910 I ironed and baked a cake for [illegible] and fixed eggs and cream to take to The Elder Daughter [illegible] at the park in afternoon. Will took me over I had a very good time came down home in a rig and home by car. Mr & Mrs [Nipher?] down home Wednesday June 15 1910 I was up early got my things ready for the boys dinner for Charlie Hedges came and the boys began to the fence I took cake down to the church and stayed for the Alumni dinner It was very nice I came home at 4.30. Hattie went from there to the Presbyterian church to the funeral of Mrs Dr [Merry?] Lizzie got back tonight.